The perfect addition to your holiday table, this Cranberry-Lime Pie is the ideal combination of sweet and tart. Whether you serve it on Thanksgiving or Christmas, your guests will love it! I hope I’m not jinxing myself, but I am like 85% done with my Christmas shopping. I’ve been 85% done since last Sunday. And yes, I’m bragging about it!! Because this is the first time in my life I’ve ever had this much done this early. Which means I can actually enjoy the holiday season instead of spending 94024 hours online clicking links and nonstop adding things and removing them from my shopping cart. I am the WORST online shopper. It’s part indecisiveness, part obsessiveness, and part just pure crazy, but I will take hours and hours to make a simple purchasing decision. I don’t even want to tell you how late I stayed up on Black Friday waffling on every purchase I was about to make. Or trying to determine how much more I had to purchase to get free shipping. Or why the one item I wanted to buy was the one item on the website not on sale. But now I am pretty much done. And because I’m bragging so heavily, that means that the remaining 15% I have to do will probably majorly trip me up and keep me stressed up until Christmas Eve. Because that’s just my luck. In addition to spending one million hours holiday shopping, I’ve had a serious amount of recipe fails lately. I don’t know what my deal is, but I just haven’t been able to get it together in the kitchen. When that happens, I generally like to go back to basics and take a little break from trying to get too inventive. I pick out a few fun recipes from magazines and cookbooks that I’ve been wanting to try and I focus on those. Actually following a recipe in the kitchen (especially from a trusted source) is so calming to me and puts me in a serious happy zone. There’s no stressing over how something will come out or seriously questioning yourself over whether to use a cup of flour or a cup and a quarter of flour (my brain does not do well in these situations). I can turn on a podcast (Spilled Milk is my weekend jam!) and just do what I love. Don’t get me wrong; I find so much joy in creating recipes and experimenting in the kitchen, but it doesn’t relax me like following a recipe does. 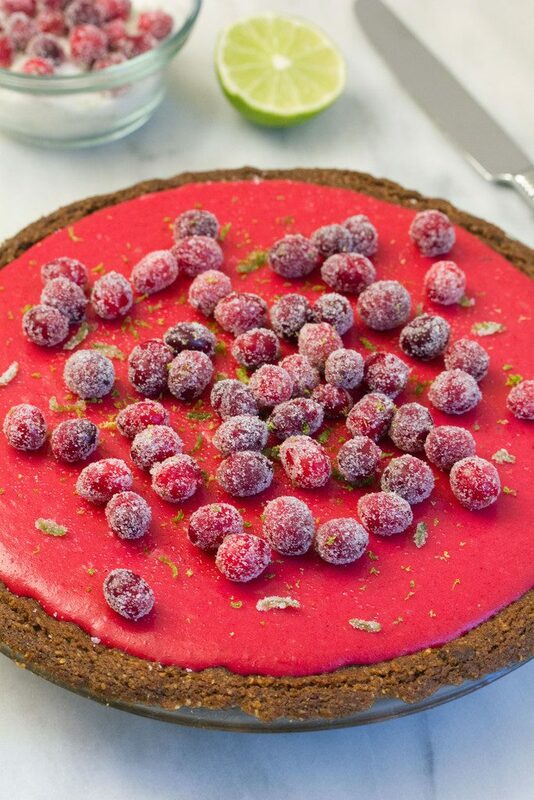 Enter this Cranberry-Lime Pie. As soon as I saw it in the November issue of Bon Appétit, I knew I’d be making it. The directions looked a little complicated, but when I actually sat down and read them, I realized it was pretty simple. I started it on Saturday night, in between going to get our Christmas tree, and finished it on Sunday morning. I’m deeply immersed in a severe cranberry obsession right now and have always had a lotta lime love going on, so to me, this pie is perfection. It will definitely be made again; quite possibly for Christmas or Christmas Eve. 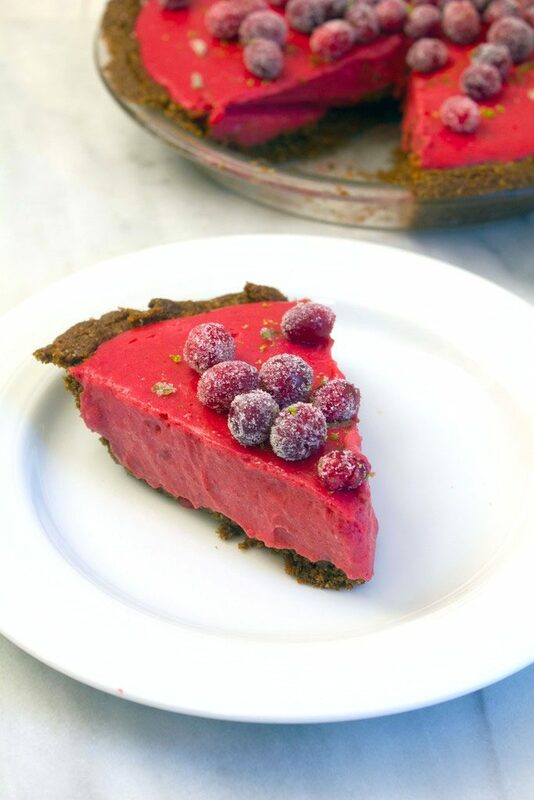 The basics of the recipe involve a simple gingersnap and pecan crust and a delightful cranberry puree turned into an indulgent cranberry lime curd. Doesn’t that sound just beautiful? Chill it for a few hours, sugar up a few cranberries for topping and this bright and cheery cranberry pie is all yours for the holidays. Isn’t it just so festive and happy and cheery? 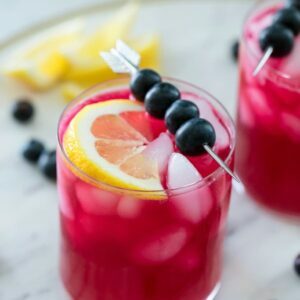 Lots of people are all about cranberries at this time of year, but I don’t think many of us also have limes on our mind. 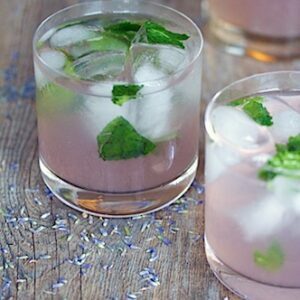 But cranberry lime is one of the all-time greatest fruit combinations (cranberry lime rickeys, anyone?!). 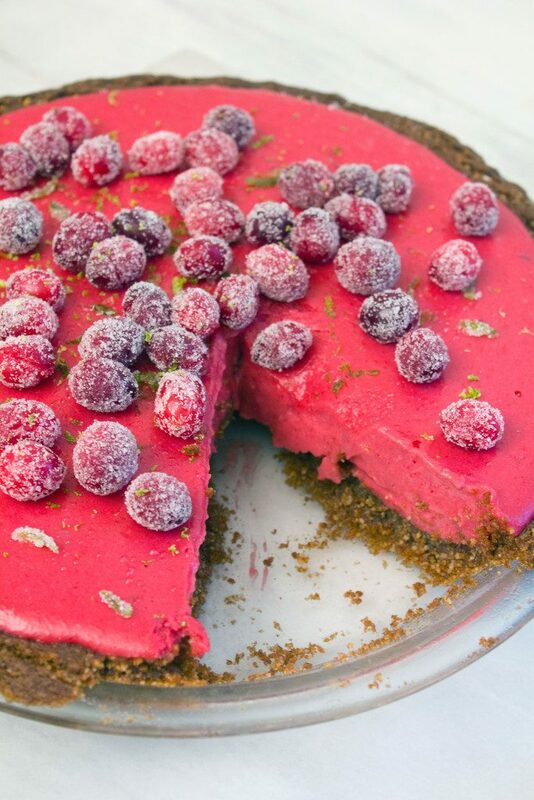 I really think that when you bring this pie out of the fridge and set it on the table, your guests will immediately ooh and ahh based solely on the vibrant and festive color. But thankfully, looks aren’t the only thing this pie has going for it… It tastes equally sweet and tart with a melt-in-your-mouth consistency. It’s an intense flavor, but in the absolute best way possible. OK, so if you’ve never made a curd before, you may not realize that it involves a little bit (depending on your definition of “little bit”) of butter. That’s why the filling is so smooth (as butter) and silky. This cranberry lime curd makes for the perfect pie filling, but I also wanted to spread it on a toast for breakfast or mix it into some plain yogurt for a morning treat. I had to restrain myself. If you’re feeling a little bit behind on your holiday shopping, I highly recommend whipping up this cranberry pie, cutting yourself a nice big slice, and cozying up on the couch with your laptop and Amazon.com. Based on my recent order history, I’m pretty sure Amazon is about to come pay me a visit to check on me and make sure I’m still capable of leaving my house. When they do, I’ll be sure to serve them a piece of this pie. This weekend, I’m going to spend a couple hours (I promise I won’t stay up until 3:00 a.m.) finishing that last 15% of my shopping. And probably the rest of the cranberry-lime pie. And then I will start singing Christmas carols and spreading holiday cheer everywhere I go for the remainder of the month. Oh, and I’ll also work on finalizing my WANM Holiday Gift Guide for Food Lovers (version #7… wow! ), so if you’re not quite done with your holiday shopping, hopefully I can offer a little bit of assistance. ‘Tis the season! How are you feeling about your holiday shopping? If you’re looking for more holiday dessert recipes, check out these Gingerbread Shortbread Cookies or these Cranberry Matcha Donuts! 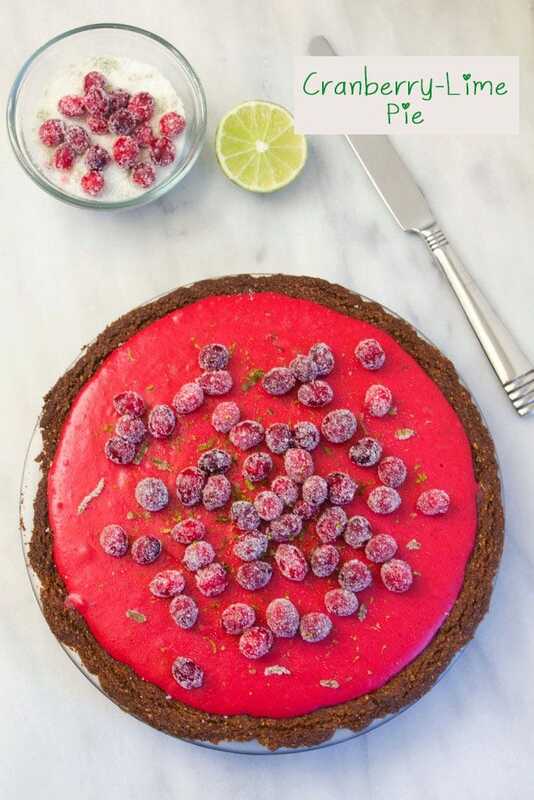 The perfect addition to your holiday table, this Cranberry-Lime Pie is the ideal combination of sweet and tart. Pulse gingersnaps in a food processor until finely ground (you should have about 1 cup once ground). Add pecans to food processor and pulse again until finely ground. Add butter and brown sugar and pulse to combine. Transfer mixture to a deep 9" pie dish and press firmly onto bottom and up sides of dish. Bake at 350 degrees, until crust is firm and slightly darkened, 12–17 minutes. If crust slides down sides, press back up. Let cool. Bring 12 oz. cranberries, 1 cup granulated sugar, and 1/4 cup water to a boil in a large saucepan over medium-high heat. Reduce heat and simmer until cranberries are bursting and most of the liquid has evaporated, about 12–15 minutes. Let mixture cool and then purée in a blender until very smooth. Please purée in a heatproof bowl set over a saucepan of simmering water (or in a double boiler) and add whole eggs, egg yolks, lemon zest, lime juice, salt, 1/2 cup sugar, and 1 tsp. lime zest. Stir mixture with a rubber spatula scraping down sides of bowl when necessary, until curd thickens and coats spatula, about 8–10 minutes. Let cool until just warm. Place curd in the large bowl of a stand mixer or in a large bowl if using a hand mixer. 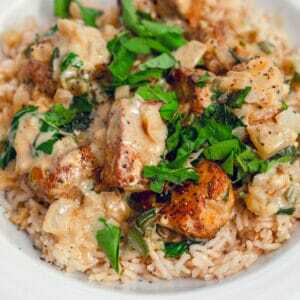 Beat on medium-high, while adding butter a piece at a time, incorporating after each addition. This will take about 5 minutes and curd will begin to look lighter in color and texture. Pour the curd into the prepared crust and chill until firm, about 2 hours. Bring 1/2 cup granulated sugar and 1/2 cup water to a simmer in a small saucepan over medium heat, stirring to dissolve sugar. Add remaining 4 oz. cranberries and cook until barely starting to soften, about 1 minute. 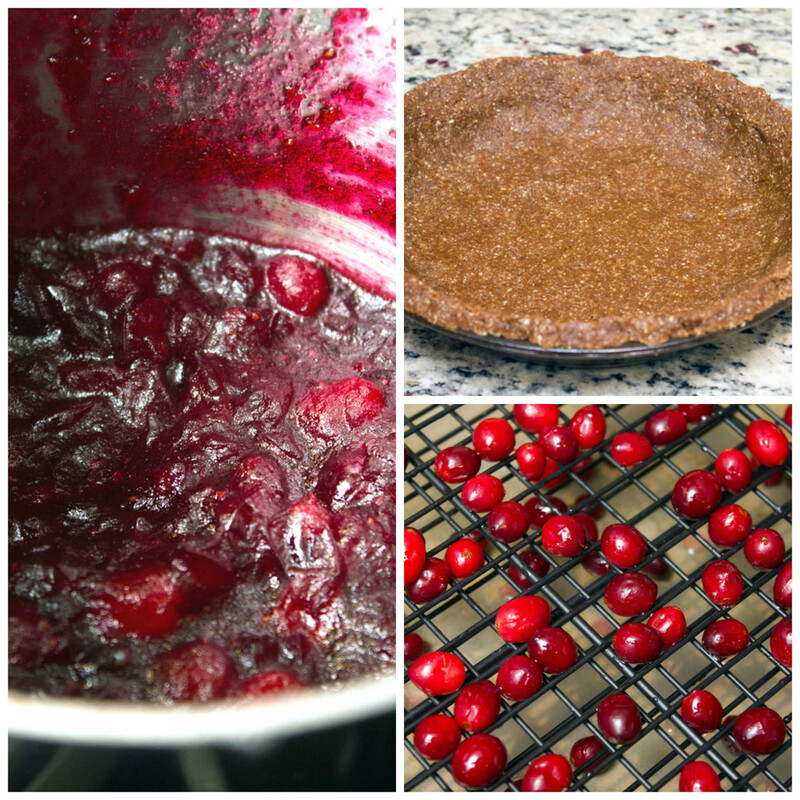 Using a slotted spoon, transfer cranberries to a wire rack set inside a rimmed baking sheet. Let rest for about 20-30 minutes, until cranberries are no longer sticky. Toss remaining 1/2 cup granulated sugar and 1 tsp. lime zest in a small bowl. Add cranberries to lime sugar and toss until well-coated. Top pie with cranberries and additional lime sugar, if desired. You can bake the crust one day ahead. Be sure wrap it tightly and keep at room temperature. The pie can be made two days in advance. Once pie has chilled and filling is firm, cover with plastic wrap and keep chilled. Do not add sugared cranberries until ready to serve. Let the pie sit at room temperature 2 hours before serving. 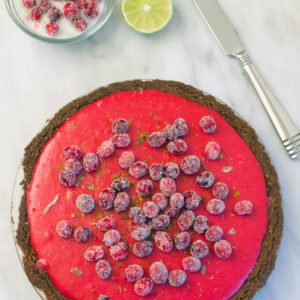 13 Responses to "Cranberry-Lime Pie"
I’ve never had a cranberry pie before but I love the idea and the color!! When I saw this posted on Instagram I was swooning so I had to stop by and get the recipe. What a beauty! I get Bon Appetit and the cover photo stopped me in my tracks too 🙂 Yours turned out beautifully – great job! That color is so gorgeous! I love this so much! Your pie looks wonderful! (I’m a big fan of lime, too.) And I’m bragging about my Christmas shopping too, since I’m about 90% done! Yay for almost being done with your shopping! We are about 60% done and I am hoping after this week we’ll be 100% done. This pie is so pretty! Love the color!! It looks so festive and delicious! Ooh I saw this pie too! 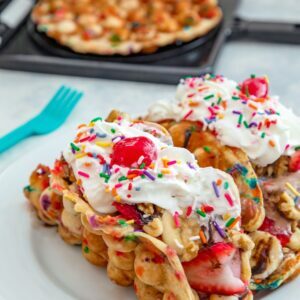 It’s a beauty – the filling just looks so luscious I don’t even want to cut a slice – just dive right in with a spoon and start eating from the middle! 🙂 I’m almost done shopping too! Miracle of miracles! haha I am almost done with mine as well! First time ever and it feels pretty darn awesome! This pie! Why have I never made a cranberry pie before?? Could there be anything more Christmasy looking than this pie…I love it! 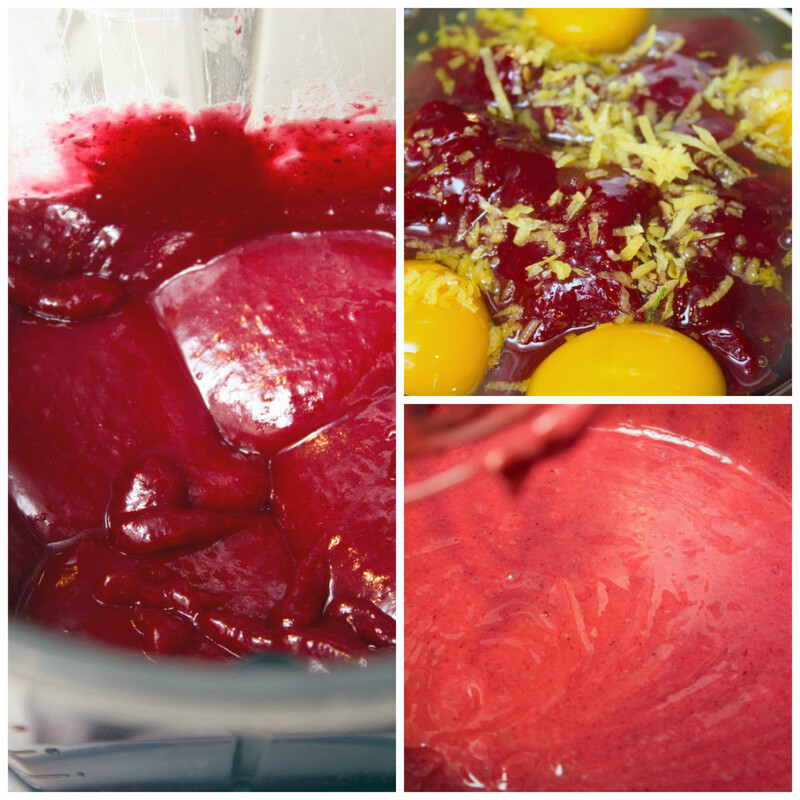 Love the sound of the cranberry and lime combo for a pie! Have you every substituted almond flour for the pecan flour? I don’t have access to a food processor here in Hong Kong and can’t only buy preground almond flour. Thoughts? @Heather- Hello! I haven’t tried using almond flour for this, but I do think they’re pretty interchangeable, so it shouldn’t be a problem. Let me know if you try it!